Warren Buffett is widely-considered the most successful investor in the whole wide world -yet, he doesn't lead a glamorous lifestyle. Contrarily, he is a leading philanthropist — pledging to donate more than 99% of his wealth to charities. His favorite restaurant is Gorat's –a local steakhouse in Omaha. He keeps it basic — simplistic is more like it. He doesn't eat vegetables. He doesn't use a computer or even a smart phone. He just reads and reads and reads. Warren Buffett has not drank a glass of water in over 50 years. He is a conscientious fellow and knows what works for him, and then he stays with it. He doesn't go out of his way to be different. He just has supreme self-confidence and effortless charming wit. The "Oracle of Omaha" has made a habit of accumulating slow and steady earners. While other people on Wall Street are high-rollers & fast shakers — taking dangerous gambles in order to make huge/quick profits, they also run the risk of making large/immediate losses. Buffett is everything that Wall St. isn't — he is an Anti-Rich Capitalist. [Warren Buffett and Other Anti-Rich Capitalists — Forbes] He chooses to invest in companies who run a reputable and upright ship. "Integrity" is the key to success and Warren Buffett is the most successful investor the world has ever seen. He has befriended a vast variety of celebrities ranging from Alex Rodriguez -to- LeBron James -to- Jay-Z. Famed investors — Warren Buffett (net worth of approx. $47 billion) and Microsoft founder Bill Gates (net worth of approx. 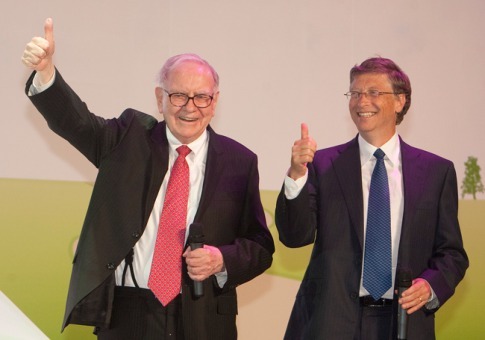 $54 billion) have collectively pledged to donate majority of their riches to charities for the sake of philanthropy. Warren Buffet - Chairman, Berkshire Hathaway | Omaha, Neb. ...God bless the Oracle of Omaha! May God and the Universe always bless people like him.